This is a book my kindergartener came home from school talking about a few weeks ago. Her teacher had read it to them during story time, and she just thought it was the best story. I, having never heard of it before, decided I had to see what all the hype was about. So, off to the library I went, and low and behold there was a well loved copy on the shelf. Naturally, I grabbed it like it was gold, nevermind that there wasn't another soul even in the kid's section with me. I wasn't about to lose out on it though, and was bound and determined to get it in to my 3 year old's pile as quickly as humanly possible. I have to say, my 5 year old's hype was spot on. This book was incredibly cute, and actually struck a cord with me as we often have our own "Hippo Lost" and "Cow Lost" moments. Hippo is Jo's lovey that she's had since she was 4mos old, and Cow is Joc's lovey she's had since the day she was born. Both go everywhere with us, and both inexplainably disappear on a daily basis. "Plaidypus Lost. Plaidypus Found. This story goes around and around." Yep, that about sums it up, but how about just a little more detail? 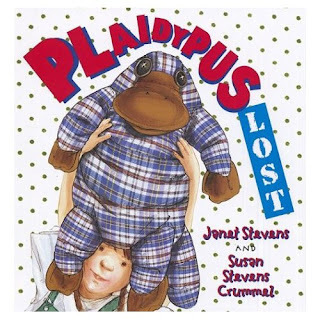 Plaidypus belongs to a little girl whose grandma made him out of grandpa's old shirt and buttons. He's big, he's lumpy, he's goofy looking, and he's absolutely and completely loved. Plaidypus goes sliding and swinging with his little girl at the park, rides in the cart at the grocery store, and goes swimming with her in the lake. But each time he goes out with his little girl she ends up distracted and forgets all about him until later when she realizes he's lost. Luckily, each time she is able to retrace her steps, and eventually finds her beloved Plaidypus. However, one day while pretending to have Plaidypus fly in the car, they hit a bump and Plaidypus really does fly- right out the car window. His girl looks and looks, but Plaidypus is no where to be found. Sad and distraught, she decides the best idea she has left is to make posters in hopes that someone will recognize the picture of Plaidypus and send him home. Days pass, and Plaidypus doesn't return. Then one day, there's a knock on the door. When the little girl opens it, she finds a brown sack with her sweet Plaidypus stuffed inside. Only, now her Plaidypus doesn't look quite the same. He's hurt, torn, and missing pieces. His girl is upset, yet she knows just what to do. Grandma made and gave her her Plaidypus, so surely she can make him well again. And, in the end, that's just what she does. Both the girls and I thought this story was well worth the read. The words were catchy and fun to read, plus the story itself made you feel happy inside when all was said and done. And the oversized hardback provided big, bold illustrations that while not my favorites were appropriate enough for the story. Last but not least, I enjoyed that there was an underlying message with this one. That message is what I'm always looking for in kid's books. I mean, you can have a great story that's totally fun and nothing more, but it's nice to have a story with even a subtle good message incorporated. For Plaidypus Lost I'd say that message was that we (kids and adults alike) need to pay better attention to the world around us and take good care of the things we have, especially those we hold dear. Poor little Plaidypus was well loved, but because his little girl was not careful enough with him she ended up nearly losing him for good. Even when she did get him back he'd been damaged and wasn't the same as he'd been before. It's true she was able to have him fixed, but such a simple solution isn't always possible. In short, I liked that the book taught kids that while it's okay to have fun and really enjoy the things we've been given and blessed with, that we must also never stop being responsible for and taking care of those things. Ooh, I can't wait to look for this one at the library. They wrote/illustrated a book called My Big Dog, and it is my 2.5 year old's joy!! Thanks again for a good recommendation!